I am THRILLED to announce that, after an intense selection process, The Six O’Clock Scramble has a new CEO, Jessica Braider! See below for more info about the fabulous Jessica and why she’s such a perfect fit for The Scramble and you! I did something CRAZY in 2003. After a thriving career in media relations, I had become a cookbook author and stay-at-home mom of two kids, ages 4 and 6. I was—and am—a solution-oriented person, and what I was doing to get dinner on the table for my family wasn’t working. Family dinner was important to me, and I knew it was to so many other people. But I also knew there had to be a better way for busy parents like me who just wanted to get a quick and easy, healthy, homemade dinner on the table and enjoy it with their families. So, I decided to launch an online meal planning site before such a thing was common—in fact business experts considered it inadvisable. You could call my approach “Ready, Fire, Aim” – I was impulsive and knew far too little, but plunged in anyway. 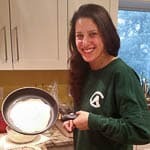 Before I had much time to think about what I had done, The Six O’Clock Scramble was born — an online weekly meal planning solution where busy moms and dads like me could get a dinner plan and a grocery list each week so they could stop “scrambling” every night when 6 p.m. rolled around. The Scramble was a welcome solution, and was covered by national media like Oprah’s magazine, The Washington Post, The New York Times, the Today Show, Real Simple and PBS. Behind the scenes, I learned hard lessons (it turns out nobody really likes frozen scrod with chunky salsa and Cheddar), struggled with technological disasters (routing members’ payments to someone else’s bank account is not a great business strategy), and endured the slings and arrows that come with being in a consumer-facing business (we all recall the response from one member after I wrote a column extolling my new Lazy Susan: “My name is Susan and I’m offended. How would YOU like it if they called it a Lazy Aviva?!”). With the help of wonderful friends and colleagues, a sense of humor, and the support of my husband Andrew, I made it work. The Scramble meal planner grew and evolved; over the years, it has helped families get millions of meals on the table. In fact, it’s still evolving. 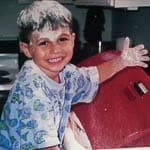 While The Scramble at 14 is a thriving teenager, my own children are now young adults. Our youngest, Celia, is heading off to college this month and Solomon left last month for a semester abroad in Melbourne, Australia. Even our doggies are getting creaky and gray. Jessica Braider is a mom of two young children, and a health and cooking coach who specializes in helping families cook simple, healthy meals. She’s a warm, intelligent woman, a quiet, confident leader, and a bold entrepreneur. Jessica and I are spending the summer transitioning to her leadership. As of September 1, Jessica will be the Big Boss. Learn more about Jessica here. Jessica is already bringing exciting enhancements for you, starting with weekly make-ahead breakfast options. She has been developing recipes for years at The Balanced Kitchen, so you’ll also see new, innovative recipes like Brazilian-Style Protein Power Bowls, Black Bean and Sweet Potato Tacos with Avocado Crema, and Moroccan Sheet Pan Chicken. I love The Scramble as if it were one of my own children, and will always be so proud to have been its founder. I care deeply about our members, some of whom have been there since the beginning and others who are newer friends. I know you will be in the best possible hands with my friend, Jessica. I simply can’t imagine a better adoptive mom for The Six O’Clock Scramble than she. Over the last 14 years, you have seen me through many of the same parenting challenges and personal triumphs and tragedies that we all experience—the evolving palates of our children, from annoyingly picky to extremely adventurous, the blossoming cooking skills of our own kids (Celia blew me away by making stuffed squash blossoms last month), Celia’s vegetarianism, and Solomon ditching the dining plan after his freshman year of college so he could plan, shop for, and cook his own meals (while keeping the corner cheesesteak truck in business). You were there for me after the sudden loss of my dad in 2007, and the longtime illness and untimely death of my best friend and collaborator, Lisa Flaxman, whom I still miss constantly. I am so grateful for the friends who have become members and the members who have become friends. My dear Scramblers, you will always have a piece of my heart and a place in my kitchen, and I will remain just an email or Facebook message away. In the meantime, I will continue to develop recipes and write, and you can see what else I’m up to at my personal and professional website, AvivaGoldfarb.com (see below for a link to a new cocktail recipe). But first, a long nap and a brief chance to disconnect from my laptop and recharge my own batteries—in short, a little time as a Lazy Aviva. Thank you, my Scramble family. I will always treasure your letters, recipe contributions, and feedback. I am honored to have been part of your family meals over the last 14 years. 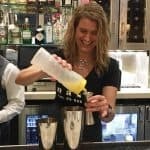 Aviva bartending at Silver in Bethesda, MD. P.S. 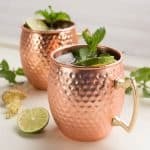 I’ll be toasting you, Jessica and The Scramble with a fresh take on Moscow Mules here. Cheers to all you moms who are making it work, rewriting the rules and lifting each other up! P.P.S. 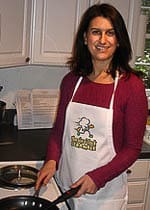 I am enormously grateful to Scramble recipe testers and team members who have helped me over the past 14 years. While there are too many to name, I want to especially thank longtime colleagues Robin Thieme (my savior), Betsy Goldstein, Linda Wolpert, Jeanne Rossomme, Kathryn Spindel, Daniel Betancur, Paola Gutierrez, Stephanie Lowet, Lee Unangst, Marla Kostis, and mentors and advisors like Steve Harrison, Daniel Neal, and Debbie Tyler. « A Hello from New CEO Jessica Braider! 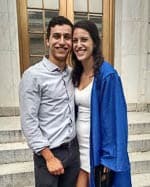 Congratulations, Aviva! SOS has been an integral part of my family since 2008. I’m sad to see you “go” but am also excited to see what’s coming with Jessica. Best of luck! Stacy, you are such a strong part of the Scramble community, Jessica and I both appreciate your support! Best of luck in this new phase of life Aviva! My kids are almost grown too, and soon I will no longer have to cook for 4, nor play beat the clock in the evening. This service has had a great impact on our lives- helping us maintain my sanity and my family’s health. And above all, the “recipes”, as my kids call them, really have made meal time a special time for us. Thanks so much!!! So happy we have shared this journey together, Carla, your kids are very lucky to have you “scrambling” for and with them! This IS huge news! 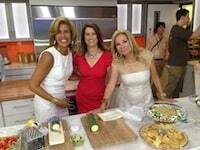 I can’t help but think back to all the firsts…the first public appearances, the first cookbook…first grade! You have built SOS into what it is today and along the way have always been most gracious with your time and your growing expertise. I know it will be an exciting NEXT chapter…best of luck to Jessica. She has our support. Thank you for being part of the journey, Ruth, and for making SOS! cookbook so much better.